In this guide you will find all nessessary informations about my Purifying Flame Inquisitor. I currently still work on the build so everything in here is subject to change. Purifying Flame is one of the new spells of the "Holy phys spells archetype". We have a phys damage base which converts into fire mostly. This build you can start from level 1 and push it deep into the endgame. It will be viable to do all current content in the game on a fair budged while maintaining very good clearspeed, good bossdamage and quite decent surviveability. On my current setup i am using Wave of Conviction in 2 setups to assist singletarget. This is a very situational tool and only useable when the enemy is not about to slap your face. Wave of Conviction has a wiered interaction with Unleash on first glance. Wave of Conviction has the limitation of always only allowing one active wave. The Unleash support does cast the Spell up to four times. This means that the spell will cancel itself and only the last of the four waves will continue travel. However, when we sit right in front of our enemy we can utilise this setup. The enemy will be hit four times in a quick succession which deals massive amounts of damage in a very short timeframe. This can greatly be used to get tough rares, beasts or even map bosses out of our way with a single buttonpress. If you crit and have it as a 5-6link you will take down up to t14 bosses immediatly. The Path of Building is my actual character which is not entirely finished yet. For the shield we use a rare aswell. Currently the prioritys are defence here, since we lack defence quite a bit. Insteat of a pure spirit shield you can lateron go for an int/dex hybrid shield to get some evasion in addition to the damage/defence mods. Aside from this we can utilise lots of other helmets. Lightpoacher or starkonjas are pretty good helmets as always. Expecialy if you consider shield charge as your movement skill. The only reason i am using "The Restless Ward" is because it dropped 6l. The BiS items for body armour are either Carcass Jack or a well rolled Shaper body armor. Currently I am using Oskarm for Assassin's Mark on hit. As soon as i finish my shaper ring i will swap out for rare gloves. The rare gloves will cover life and resistances of the build. A good unique alternative are the Command of the Pit gloves. For the missing 20% conversion I recommend to use the veiled mod for conversion. For boots I currently am using rares and this will mostl likely stay this way. The BiS boots in Synthesis will be rares with 35% movespeed and the Onslaught implicit. A very good unique alternative are Burbonic Trails. Just covering life/resistances. Look for cast speed if you can. Is currently waiting on multicrafting. On the amulet you can cover multiple aspects. Atziri's Promise always is great. Dmg and surviveability. On the diamond flask you later want the crafted % critical strike chance during flask effect from the mastermind encounter. The anti curse stibnite is one of my all time favourites. Great uptime and utility. Insane surviveability boost. Alternatives are Taste of Hate, Cinderswallor Urn, Bottled Faith and Sin's Rebirth. Arcane Surge does not work with Eldritch Battery keystone so we do not use it. Vaal RF for the high dmg boost. In addition to the great damageboost it has a very high "Soul gain prevention duration". We increase this duration further with our increased duration support. On our boots we use the enchant "Onslaught during soul gain prevention" to maintain onslaught most of the time. Bloodrage is a great way to sustain frenzy charges which boost our damage quite effectively. In addition to that we can utilize the Soul of Arakali pantheon with the upgrade "Queen of the great Tangle". Whenever our cwdt setup procs, we will gain 50% increased recovery rate of life and energy shield which greatly boosts our consecrated ground. Well, surviveability and BR synergy. Leveling trees are in the PoB inside the gearing section. Below the skilltree you can select the tree for your current level. You can start out with purifying flame with level 2 and push it as far as you want. 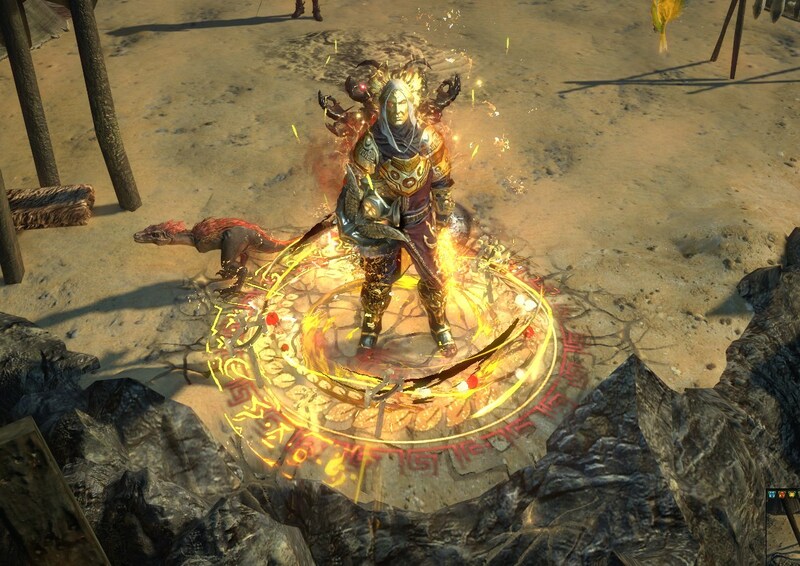 Pick up wave of conviction in act 2 and add the unleash support in act 4. The rest is basic caster leveling. A: Xoph's heart overall is a great amulet. But it has certain problems. Since we are playing inquisitor we do not utilise the 10% fire penetration at all. In addition to that we can not shatter anymore, which might be a problem in higher maps and deeper delve. But if you do not care about shatter you can definitely use the item. Its a great damage and surviveability buff. Looks interesting. This skill definitely needs more love from content creators. Haha, yea its a pretty good skill. Was expecting to see it played by alot more people. I currently livestream the writing of the guide. If you have any questions tune in. your guide gives a very good foundation, now you just need to put a house on top of it :D (dps and survivability). Will be hard in SSF but the league just started :). The house will come in the next days with upgrades. But those take a few days in ssf.